On October 17, 2018 at 7:00 p.m., the Escola Universitària Mediterrani celebrated the graduation ceremony of the 2014-18 class and the inaugural act of the 2018-19 academic year at the AXA auditorium in Barcelona. 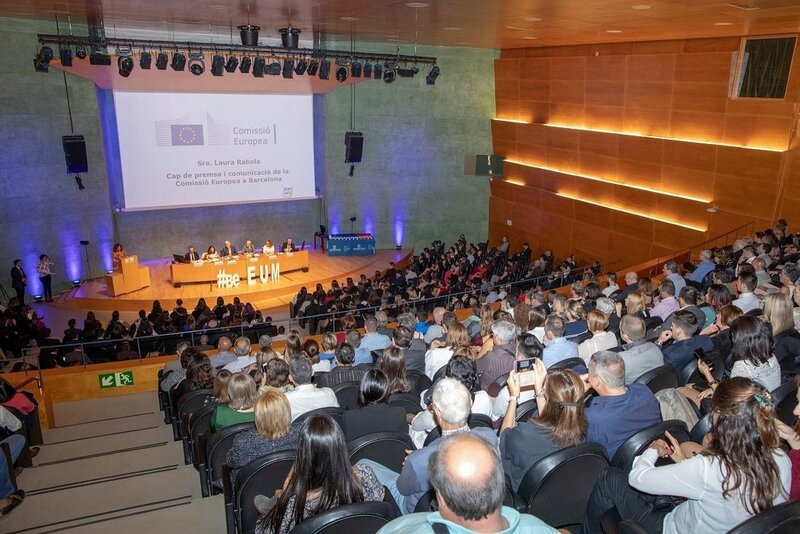 An event attended by more than 500 people including students, family members of students, teachers of Mediterrani and representatives of companies and institutions. From the presidential table the General Director of EU Mediterrani Mr. Eulogio Arza inaugurated the event, who opened with a welcome speech thanking the representatives of companies, teachers and family members of students and especially the participation, from the presidential table, of the Press Officer of the European Commission in Barcelona Mrs. Laura Rahola and of the Vice-Rector of Communication and External Relations of the UdG Dr. José Antonio Donaire. The Academic Director Dr. Blanca Braut intervened next highlighting the objective of EU Mediterrani which is none other than to train professionals of the highest level. Dr. Braut congratulated the graduates and their families remembering that in this is the 8th promotion of Graduates in Tourism, the 2nd promotion of Graduates in Marketing, the 15th promotion of Superior Technicians in Travel Agencies and Event Management and the 15th promotion of Superior Technicians in Management of Tourist Accommodation and all of them asked courage and enthusiasm to face this new stage. Next, Mrs. Laura Rahola, Press Officer of the European Commission in Barcelona congratulated the students by reminding them that they are already graduates but that they are at the beginning of everything and that, like them, Europe is also at a moment in who has to decide their future, a future that will allow them to work in the largest single market in the world and that will be them, as young people who will make the changes that Europe will need to grow. Next, Professor Emilio Descarrega, Coordinator of Internships of the Degree in Tourism, announced the delivery of the Mediterrani Business Award 2018, which this year has fallen to the company Hard Rock Cafe for its important involvement with the training program of our center. Received the award Ana Pavón, director at Hard Rock Café and former student of the Degree in Tourism at EU Mediterani. Next Dr. Arnaud Laygues, Head of the Languages ​​Department of EU Mediterrani, highlighted the excellent results obtained by our students in the French degrees awarded by the Chamber of Commerce and Industry of Paris and also English of the University of Cambridge, which EU Mediterrani includes in its respective university degrees thanks to the center’s advanced foreign language program. The extraordinary prize of the University of Girona was also awarded to the best academic record of the Degrees of Tourism and Marketing, which on this occasion fell to the students Marta Jarreño and Sergi Feliu respectively. Both received congratulations from the table and a loud ovation from the audience. The appreciated intervention of Dr. Jose Antonio Donaire, Vice-rector of Communication and External Relations of the University of Girona, who made an interesting reflection to the students about the way of feeling university graduate and also wanted to put in value EU Mediterrani of whom He highlighted the recognition from the UdG of the prestige, quality and reputation of our center, words that from here we want to thank and encourage us to improve every day. At the closing ceremony, Mr. Eulogio Arza, General Director of EU Mediterrani, inaugurated the new academic year, offering attendees a cocktail where the nerves of the beginning became smiles of satisfaction and happiness for everyone.